Green House, Good Life: Say Trees! Remember the free trees the city offered us this winter? They wanted to give us up to three trees on the condition that we would plant them in the right of way so they would eventually grow big enough to shade the street and help to combat urban warming. 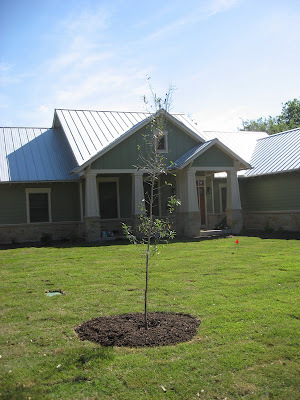 We chose a live oak and two lacey oaks, but then we received word that lacey oaks weren't available after all, so we decided to just get the live oak and buy a tree to plant farther back on our property. We finally planted the live oak the night before the sprinkler system went in so that the irrigation guys could run a drip line right to it. 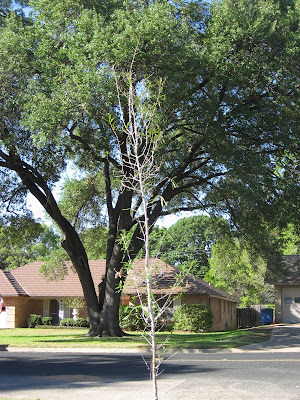 Here it is against the backdrop of our neighbor's amazing 50+-year-old live oak tree. Can you imagine our scrawny live oak growing that big in 50 years? The original owner still lives in that house, and the tree was planted when it was small enough for her then-small children to jump over. In retrospect, three oaks in the right-of-way would have been too much (even though the other two, lacey oaks, wouldn't have grown nearly as large). Once our sprinkler system went in and we had sod lined up, we were all ready to take a break until fall before planting everything in the beds. 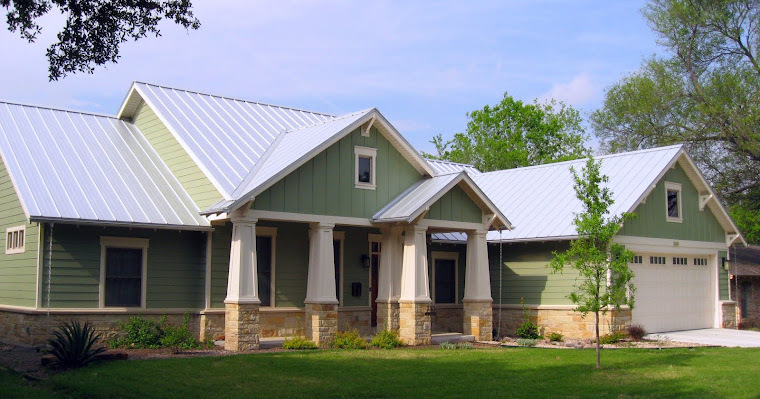 But then our irrigation guy reminded us that we only have six months from the permit date to get the sprinkler system inspected (which would require us to get the beds planted by then, so he could finish tying in the drip system, vegetable garden lines, etc.). That would only give us through October to get everything in. And since it could still be in the 80s in late October (which would mean the plants would still need lots of water to survive), it didn't seem like we would actually gain much by waiting until then. So instead of taking a break from landscaping, we kicked plant selection into high gear. And that's what led us to look at trees. We spent the better part of a Sunday driving from nursery to tree farm to nursery, visiting a total of five (in addition to the several that we had already scoped out as we chose plants). 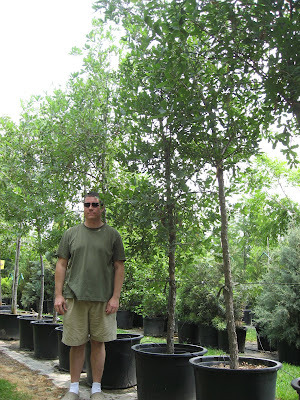 We were looking for a lacey oak and a pink crape myrtle in one of the taller-growing varieties. We also wanted them to be pretty sizable already -- the one place we wanted to splurge and get well-established specimens was in the tree department. We lucked out. 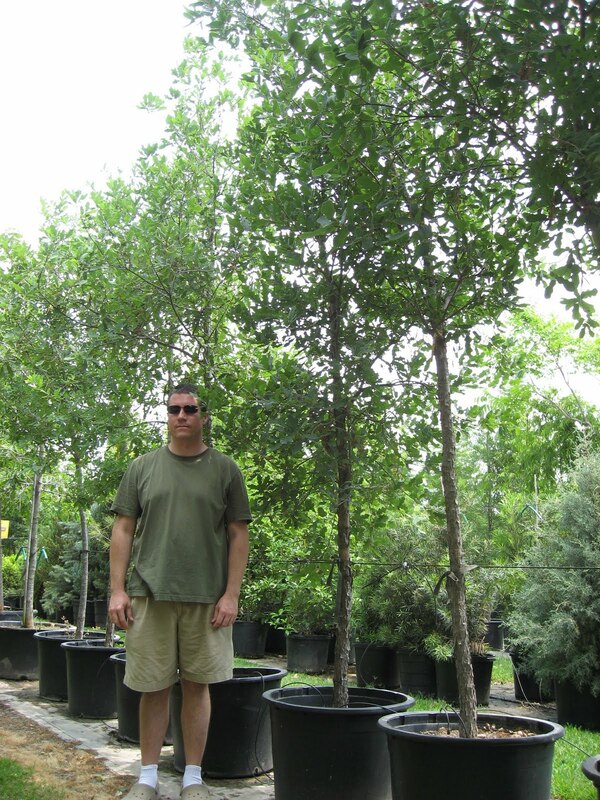 A nursery not too far from us that we'd never even heard of ended up having a huge selection of all types of trees. Their inventory was also extremely well-organized and marked, which we now realize is rare among such places. We found that most nurseries might have signs for "annuals," "perennials," and "trees," but many lack specific names and/or pricing info, etc. (We also went to one place that had an entire section of what appeared to be dead crape myrtles. Even if we had found something (live) that we liked there, it would have been really creepy to buy trees from a nursery we can't help thinking of as "the tree cemetery" -- so we were pretty glad to come up empty there and move on to the next one.) Anyway, back at our newfound favorite spot, it was not only easy to find the crape myrtles and lacey oaks, but we even found specimens that we really liked. And it was like Christmas when we asked about the charge to deliver and install and they told us that installation was included in the price. (And delivery was a flat fee of just $25.) 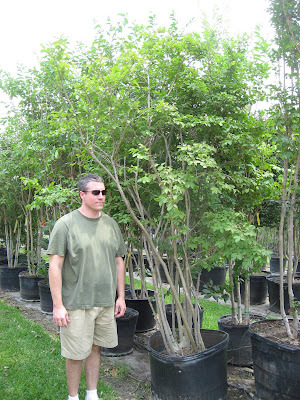 So, after looking at a couple more tree farms, we returned that same day and bought a 30-gallon lacey oak and a 45-gallon crape myrtle, to be delivered and installed in about a week. Which means we can call our irrigation guy back out to finish up the drip system really soon (assuming we can get everything else done that quickly).